Whoo! I have permission to post now. And because of that I'm not getting any reading done for my midterm on Monday. Anyway, here are some Milani Swatches. Like Vanessa had mention in her previous post, these eyeshadows might be becoming obsolete in some stores that carry them because they might be replaced with the wet/dry eyeshadows. But I'm not sure if this is the case. However, I was lucky enough to find them in Target or Walgreens. I personally like these better because it has less glitter in it, and the fact that it fits in my MAC pallet! Target carries this for $2.99 while Walgreens retails it for $3.49. Target has cheaper prices but minimal to almost nothing in stock whenever I go. Walgreens however had a whole buttload of them in stock and more variety in colors. I still love MAC eyeshadows. 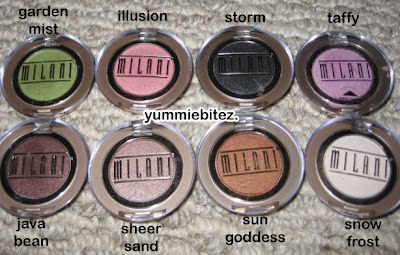 But Milani eyeshadows aren't so shabby for super cheap makeup. NYX cosmetics still trumps all when it comes to cheap makeup though. These swatches by the way were applied without a primer underneath. I don't know why, but your swatches show up way more pigmented than mine does when I use them! Maybe I got a bad batch? I love these Milani e/s, but some of them are duds. I can't remember which ones, but I remember I got a few which had horrible color payoff. OK, now you've done it... You've given me yet another product I can't live without. I don't know if I should say thanks or damn. 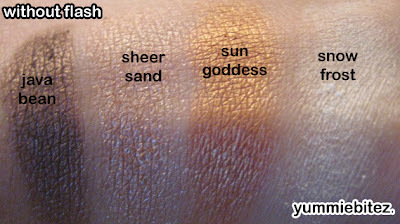 great swatches, i've yet to try these...b/c they're always out of stock! I love this brand so much! Get to about them from a friend of mine, while doing make-up lesson London and now I am in love with them. This really helped me a lot to improve my skill.